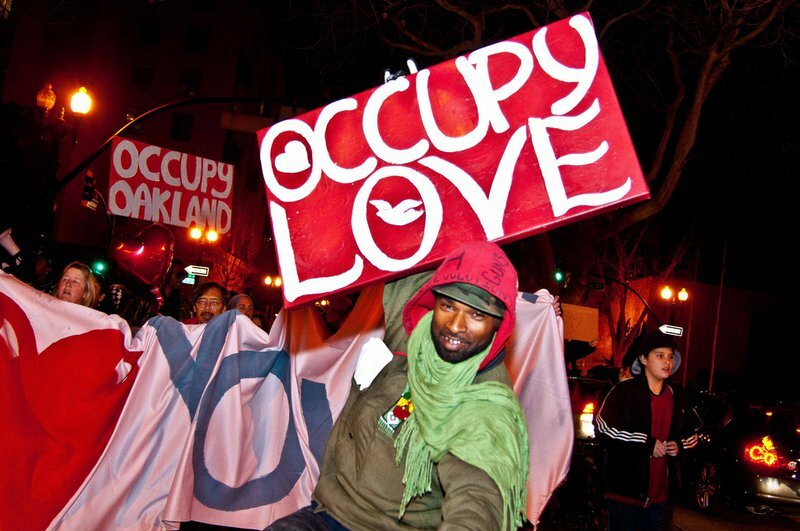 Occupy Love, Hella Love Oakland March, February 14 2012. Credit: Flickr/Glenn Halog. CC BY-NC 2.0. As an intersectional activist who is concerned about the future of our movements, I’m really worried that social justice activism in the West is stuck in a dangerous state of disrepair. Ideological purity has become the norm. Social justice movements, which were originally about freeing marginalized people from oppressive institutions and social structures, have become imbued with their own narrow framework of morality. Our knowledge base is made up of reactionary think-pieces, self-righteous social media posts, romanticized narratives of movement histories and prescriptive checklists of how to stop being problematic. Activists who are deemed “woke” are praised and accepted, while others who are judged not to possess a sufficiently layered analysis of power and oppression on the axes of race, gender, sexuality and disability are demeaned or excluded. In many social justice communities, fear and shame are regularly used to control other people’s behavior and shut down contentious discussions. As someone who is deeply embedded in activist communities in Seattle that organize around anti-racism, prison abolition, and queer and trans folks of color this affects me every day. I’m so afraid of being called out in this way by another member or group—and possibly losing access to my networks of belonging and support—that I am very, very careful about the political opinions and ideas I put out into the world, especially if they are still in development. Some readers relayed that they wept with relief to read that they weren’t the only ones feeling utterly ostracized. Others shared that they felt like they were not allowed speak up in activist spaces because they were newer to activism and weren’t familiar with social justice language, norms and analyses. Readers who identified as having privilege expressed feeling turned off by the ways they had to perform unquestioning allyship to marginalized people and respond to the guilt by shrinking themselves into nothingness. This pattern is hugely counterproductive because movements need critical masses of people to function in ways that transform the structures of power. It doesn’t make sense to push out members because they don’t go about doing social justice work in exactly the same way you do. Sometimes people make horrible mistakes that reinforce the status quo of power, but that doesn’t mean we don’t need them alongside us. Heated debates are unfolding in progressive spaces around cultural appropriation, white feminists co-opting activist movements and ‘intent vs. impact’ among other issues, and such debates are important; but while we argue the finer points of detail among ourselves the Trump administration has been largely left to its own devices to separate immigrant families, increase corporate tax cuts, reinforce the Muslim travel ban and revoke trans women’s passports. The danger is that intra-group debates create rifts within, or even implode, communities that have to be strong and united in the fight for justice. I have no problem with the well-intentioned content of these pieces since they often bring up forgotten voices or conveniently-ignored viewpoints. But the way they are presented, re-shared and absorbed into activist culture as infallible gospel truths removes people’s agency to think for themselves. I want to be a member of a thriving and diverse social movement, not a cult or a religion. Furthermore, I worry that identity is being deployed as a way to separate people rather than to create coalitions to work together en masse. There is so much distrust of white, male, and/or straight people that marginalized identities often serve to regulate the makeup of activist communities. To tell the truth, I’ve also participated in this kind of behavior myself in queer and trans people-of-color spaces. After being rejected from dominant society for so long, it felt good at first to have full permission to turn away from the kinds of people who had invalidated me for much of my life. While I do believe it’s critical to curate identity-specific spaces, at this point I wonder if judging all people with more privilege hurts more than it helps. As former US president Barack Obama tweeted recently about democracy: "You can't do it if you insist that those who aren't like you because they're white, or because they're male...that somehow they lack standing to speak on certain matters." What’s the antidote to this situation? I believe that social justice activists must be committed to rooting out supremacy, dogmatism, and unhealthy behaviors inside themselves while fighting for justice in society. And that means prioritizing the building of healthy relationships both with ourselves and with others, choosing alternatives to rage, and honoring ourselves as whole beings. So much of modern activism is a public performance, amplified by the lightning-quick churn of the internet. What does it tell us about the condition of our hearts when we are reactive and not engaging in slow contemplation? The ancient Chinese philosopher Lao Tze reminds us that “knowing others is intelligence; knowing yourself is true wisdom.” Tending to our internal landscapes and cultivating wisdom and character is paramount to maintaining integrity as an activist. Whether through practices steeped in spirituality, religion, movement, ancient texts, nature or any kind of higher power, some sort of internal practice is necessary for sustaining ourselves. For example, Black Lives Matter co-founder Alicia Garza goes against popular opinion and espouses an attitude of welcome and forgiveness towards newer activists, especially toward white feminists who are still trying to grasp the uniquely harsh struggles of Black women. As she says, “if our movement is not serious about building power, then we are just engaged in a futile exercise of who can be the most radical.” This means setting aside the desire to be seen as the ‘most woke’ or the ‘most correct’ and accepting people at all stages of their activist journeys, no matter how outdated their politics may appear. Another internal quality that strengthens and grows activist movements is compassion. So often, when we as marginalized people are disregarded and abused by society we respond with rage and fighting back. How can we challenge ourselves to cultivate care and compassion for those we perceive as our enemies, so that they can be transformed into accomplices and allies? How can we hold anger and love in balance at the same time in our hearts? One great example is the life and work of Civil Rights elder Ruby Sales. In a recent radio interview she called for a ‘liberating theology’ for poor, white people that shows them that they worthy of recognition. She understands that speaking to the redeeming parts of white people is essential for bringing them along in the fight for racial justice. This is a profoundly different message from the flurry of think-pieces that have blamed working-class white people who ‘voted against their own interests’ to elect Donald Trump. My new book, Toward An Ethics of Activism: A Community Investigation of Humility, Grace and Compassion in Movements for Justice, maps out a whole range of ways to address the relational problems of progressive activism. For example, trans activist and law professor Dean Spade outlines a toolkit for resolving interpersonal conflicts within activist organizations so that they can stay intact. He draws on the embodied practice of Generative Somatics to lead the reader into a set of self-reflective questions when feelings of anger, hurt or disappointment arise towards another person. This includes taking space to recognize how you are feeling in your body, identify past wounds that are being triggered, ask yourself what else is true about the person who harmed you, and attempt to seek reconciliation privately. At the root of all this work is a long and deep-seated history of oppression. Marginalized people have every right to fight back and rage about the injustices we and our ancestors have experienced in the face of colonization, slavery, imperialism and capitalism. At the same time, holding onto a constant state of antagonism towards those who are more privileged than you is exhausting and leads to devastating personal burn out. Aligning on the ‘right side of history’ in struggles for justice doesn’t mean that our own communities don’t have serious areas of growth to address, including patterns of intolerance and dominance. I believe that we must create ample space for rage and critique and also humility and gentleness, understanding that they are all valid expressions of the spectrum of human emotions. We must honor our full humanity, especially the parts of ourselves that aren’t in alignment yet with our liberatory values. And part of honoring our humanity means honoring the humanity of others, even that of our enemies and oppressors.